Downtown Muncie sidewalks are an obstacle course for the disabled despite years of improvements, an accessibility advocate said this week. But the problems cited by Linda Muckway at a city board of works meeting this week weren’t about curbs that are impossible to surmount or uneven surfaces. 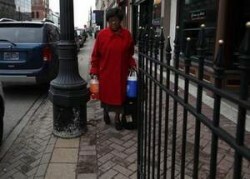 “Lots of places are impassable because of the fences around dining places,” Muckway, chairman of the City-County Council for People with Disabilities, told the city’s works board on Wednesday.